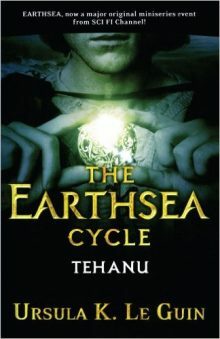 Tehanu: The Last Book of Earthsea is a fantasy novel by the American author Ursula K. Le Guin, published by Atheneum in 1990. It was the fourth novel set in the fictional archipelago Earthsea; a sequel following almost twenty years after the Earthsea trilogy (1968–1972); and not the last, despite its subtitle. It won the annual Nebula Award for Best Novel and the Locus Award for Best Fantasy Novel. Years ago, they had escaped together from the sinister Tombs of Atuan — she, an isolated young priestess; he, a powerful wizard. Now she is a farmer’s widow, having chosen for herself the simple pleasures of an ordinary life. And he is a broken old man, mourning the powers lost to him through no choice of his own. Once, when they were young, they helped each other at a time of darkness and danger and shared an adventure like no other. Now they must join forces again, to help another in need — the physically and emotionally scarred child whose own destiny has yet to be revealed.